Have you tried the Elegant Butterfly Punch and Papillon Potpourri combination yet? No? It's time you give it a try! The Papillon Potpourri stamp set is such a good value. You get seven stamps, and the wood set (132058) is only $18.95, while the clear set (123759) costs merely $14.95. I had some textured Wild Wasabi cardstock left over from a long ago project, and that's what I used for the background of the card. While the textured cardstock is no longer available, you can substitute it with the new Core'dinations paper that, in the new catalog, which goes live June 1, will now be available in all of Stampin' Up! 's exclusive colors. Core'dinations cardstock is a thick, sandable paper that is textured on one side and smooth on the other. The inside of each sheet is a monochromatic color that can be revealed by sanding, tearing or otherwise distressing. A fun, luscious paper to work with. Another thing that makes me sad is the retirement of the Curly Cute stamp set, from which the Thank You is created. Oh, well. Who says I have to stop using it, right? From scrap of Basic Black card stock, punch out three 1 1/4" squares. 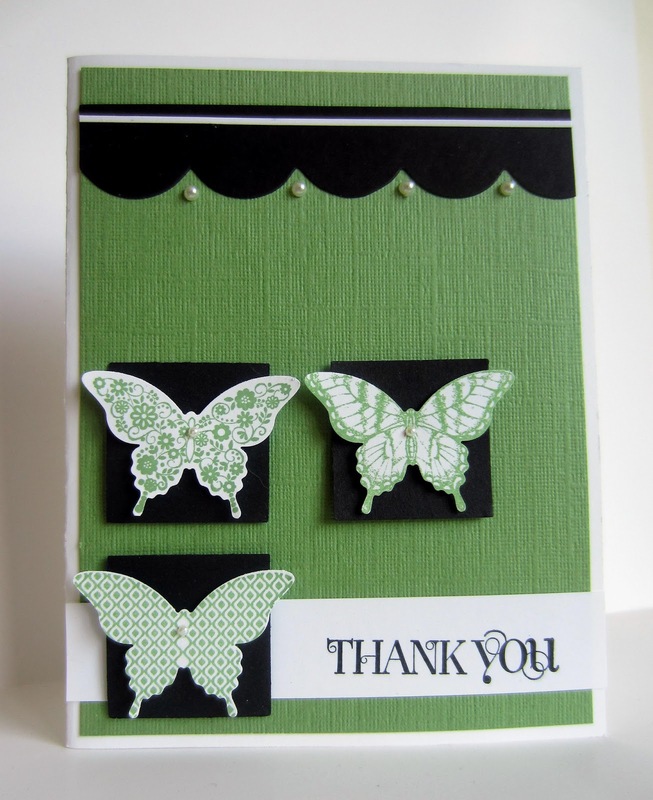 On a scrap of Whisper White cardstock, stamp each of the large butterfly designs once in Wild Wasabi. Punch out the butterflies with the Elegant Butterfly Punch. With Stampin' Dimensionals, attach them to the three black squares. Add a small pearl to each butterfly. Use the Tasteful Trim die in the Big Shot to create a 4" strip of the scallop design. Adhere a 4" x 5 1/4" piece of Wild Wasabi cardstock to the card front. About 1/4" from the top of the Wild Wasabi piece. adhere the scallop strip. With teeny dots of the green glue, attach a very thin piece, about 1/16"-1/8" x 4", of Whisper White toward the top of the straight portion of the scallop strip. Add four of the medium-sized Basic Pearls inside each dip of the scallop. On a 3/4" x 4 1/4" strip of Whisper White, stamp Thank You (or sentiment of choice) towards the right side in black ink. Attach the strip to the card about 1/4" up from the bottom of the green. Space the butterfly squares onto the card with a Stampin' Dimensional in the center of each one. So delicate! Love butterflies and green too! That's a really pretty card. Your color combo is so different but works great. Love this, Linda! I just did a small project with paper butterflies myself. Your cards are always lovely ! Hello! Newest blog follower here! I love your blog! I have a friend who just started doing the punch cards, and they're so lovely!!! I like the combo here and the colors too. The green and black combination is so refreshing to look at! Very nice card, I love butterfly too. New scrapbook and papercraft maker here. Hi from California. Gorgeous card! I love the butterflies and the sweet little pearls. So pretty! Thanks so much for linking up at the Real Family Fun link party! Hope to see you next week. I really like that color palette. Thanks for linking up. Lovely card Linda!! Those butterflys are some of the prettiest out there! I always love using them when I make cards. I layer them sometimes so they look fluttery (is that a word?). The green color is so pretty. I don't think I ever had any of that paper either...but the coredinations papers sound wonderful!! To use it through the Big Shot would be so fun! !